GACC responds to CAA consultation on Airspace Design Guidance. Wherever a new flight path is put, thousands of innocent residents will have their lives ruined and their houses devalued. The CAA should not approve any new route without making it a condition that the airport must pay full compensation, as is the case with a new motorway. Read response. CAA confirms Departure Route 4 - despite 17,000 complaints. See GACC press release. GACC responds to Airspace consultation. We tell the Government that we welcome the new policy to permit dispersal or respite instead of concentrated flight paths; that the new Noise Commission should have much stronger powers to control noise; and that we oppose any attempt to pass control of noise and night flights to airports. The introduction of satellite navigation for all aircraft departing from Gatwick (like satnavs for cars) means that all aircraft follow the same narrow routes, causing great distress to those below. This was justified as being in line with the Government policy of reducing the number of people 'significantly affected' by aircraft noise. The consultation on Air Space by the Department for Transport published 2 February, however, suggests a new policy which will permit dispersal or respite. As part of a delegation to Lord Ahmad, Minister for Aviation, GACC extracted a promise from him that the new aviation policy statement would revise the policy of concentration - and permit dispersal or respite where local circumstances make it appropriate. The delegation also included representatives from Heathrow, Stansted and Edinburgh. It was organised by the Aviation Community Forum, a newly formed organisation bringing together community aviation groups at all UK airports. Read letter to Lord Ahmad, (November 2016) confirming the conclusions of the meeting. GACC's Response, published 4 May 2016, is here. The NMB has been set up to oversee the implementation of the Arrivals Review. GACC is not a member - see note. GACC guide to Gatwick community groups (March 2017). Map showing location of the main protest groups. A revision of Route 4 (take-off to west and turn right) in May 2016 has caused another outburst of complaints, and the creation of a new protest group FairPlaynes. See Gatwick Route 4 blog. Letter to CAA (September 2014) (summarised below). Letter to the CAA January 2015. This is what we told the CAA, and subsequent action. The CAA should declare the recent (unintelligible) consultation by Gatwick Airport Ltd on Airspace Changes unfit for purpose and therefore void; CAA are now improving the procedure for making changes to flight paths. If a formal proposal is made for a new departure route to the south west, you should refuse permission; proposal withdrawn by Gatwick. The CAA should revoke their preliminary approval for a new departure route to the north west, outside the existing NPR; CAA have done so. For arrivals the CAA should insist that NATS introduce day-time respite routes from the new merge-points to the glide-slope; point-merge plan shelved. In relation to all concentrated arrival or departure PBN routes, the CAA should put pressure on Gatwick Airport Ltd and other airport operators to introduce voluntary schemes for compensation on the same basis as the Land Compensation Act. Some compensation proposals in AirSpace consultation - but very inadequate. See response. Also item below. GACC presents our case to Government. March 2015 (left above) GACC, together with six local protest groups and four local MPs, delivered to the Prime Minister a joint statement demanding dispersed flight paths and no second runway. See press release. June 2015 (right) GACC joined groups from Heathrow for constructive discussions with the Department for Transport. Actions agreed. Both delegations were organised by GACC press officer, Sally Pavey, who is also chair of the protest group CAGNE. A new system for dealing with arriving aircraft was due to be introduced. A generalised consultation was conducted by Gatwick and NATS in 2014. See GACC response. A further consultation was due in 2016. GACC has pressed hard for the 'arc' (sequencing legs) to be out at sea, and for multiple routes from the merge point to the glide slope (extended centre line). The latest indications (December 2015) are that plans for a point-merge system at Gatwick may be dropped. Instead a system of timed arrivals may be introduced whereby the speed of aircraft is adjusted so that each arrives at the exact time that a runway landing slot is available. GACC would be concerned that this would tend to mean all arriving aircraft following a single track. The Arrivals Review, published January 2016, recommended that the idiotic only one complaint a day system should be scrapped, and that all complaints should be recorded. And that the complaints handling system should be improved. Gatwick introduces new complaints system - making it harder to complain! The Airports Commission has published maps showing the possible positions of new flight paths if a new runway were to be built. It is emphasised that these are only indicative. What the map does show is that at full capacity there would be twice as many aircraft on most flight paths. Plus new routes over Warnham and over Copthorne, plus a new route to the east of Horsham. See NATS Airspace Report page 39. See GACC Research Study on flight paths with a second runway. In face of massive protests across four counties, Gatwick Airport decided to postpone their proposals for a new 'point-merge' system for arriving aircraft, and for new departure routes to the south-west. See GACC press release. 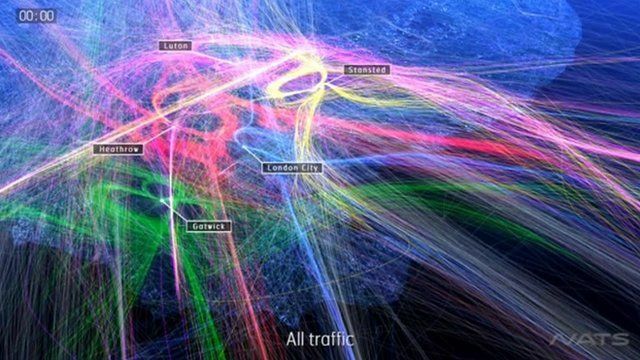 (September 2014) But most of the new concentrated departure flight paths, introduced in 2013 have been confirmed. See flight path review - above. Most people under the new concentrated flight paths implemented as a result of the new satellite navigation would prefer a return to peace, rather than compensation. But in case it is not possible to turn the clock back GACC has asked local MPs to press for an amendment to the Land Compensation Act so that those who find themselves under the new 'super-highways in the sky' can receive compensation.